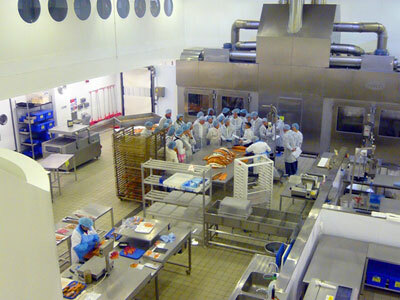 You will begin at 11am with a tour of Forman’s famous London smokehouse, showing you the process of producing the world’s finest smoked Scottish salmon. Afterwards, you will take a seat in Forman’s, the onsite riverside Restaurant and Bar which has an incredible view of the Olympic Stadium and a viewing gallery into the smokehouse. It is here where you will enjoy a smoked salmon tasting platter to share, accompanied by a bottle of still or sparkling water. Also included is a 30 minute talk on the history of H.Forman& Son which goes back over a hundred years. Following on from this will be a 30 minute smoked salmon carving demonstration on the factory floor by the Guinness World Record Holder, who previously won a carving competition against Gordon Ramsay. If there is an exhibition on at the time you will have a tour of the Forman’s smokehouse art gallery, a spectacular contemporary art project space on the top floor of the smokery. At the end of your experience you will have the opportunity to purchase the salmon you have tasted and other items produced in the smokehouse. 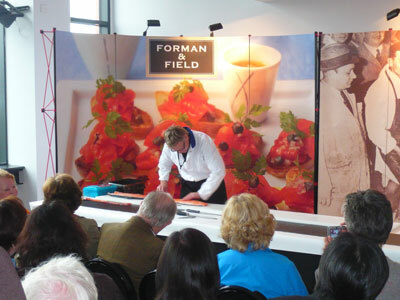 To make your tour even more special, you can choose to add a Smoked Salmon Carving Masterclass, where our expert Darren Maston will teach you how to hand carve a side of smoked salmon, the Forman way; a skill which will enhance your enjoyment of smoked salmon and is a great party-piece too! Come and see behind the scenes at Britain's Oldest Smokery. Here at Forman's we use traditional methods of curing and carving salmon with state of the art forms of smoking salmon to produce the truly artisan London Cure Smoked Salmon. You'll have a talk and potted history of Forman's by Lance Forman himself. a smoked salmon should be carved (in lightning speed). Forman's London Cure Smoked Salmon! If you’re looking to extend your factory tour into a full day, why not add on a guided tour of Queen Elizabeth Olympic Park provided by a professional who can bring the area to life? Blue Badge Tourist Guides have worked on the Park throughout the construction period and during the Games, and they continue to lead walking and coach tours for thousands of visitors in more than 28 languages. They can arrange visits to venues and will tailor the tour to your particular group. Learn about the history of the area and how it was transformed to host the 2012 Olympic and Paralympic Games, as you take in views of the world-class sporting venues. Weave through beautiful parklands, fountains and waterways and explore the trail of art sculptures. See some of the iconic venues such as the London Aquatics Centre, the Copper Box Arena and the Lee Valley Velopark, and hear about the future use of the Stadium. The guides will share personal insights and their knowledge of London's Olympic and Paralympic story, and they’ll answer any questions you have about the Park.